The M247 General Purpose Machine Gun (GPMG), formally known as the Machine Gun, Caliber 7.62 mm, M247, is a machine gun used extensively by the United Nations Space Command Armed Forces. It is a scaled-down version of the more widely utilized M247H Heavy Machine Gun. The M247 GPMG is chambered for the ubiquitous M118 7.62×51mm FMJ AP cartridge, unlike the M247H, which uses the 12.7mm high velocity cartridge. 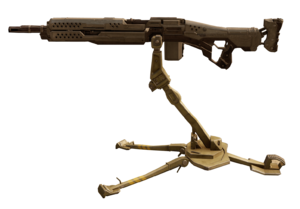 Being a general-purpose machine gun, the M247 is fed via a belt box on the right sight of the gun and is usually deployed on a tripod. The weapon's mobility allows personnel to quickly establish defensive perimeters or to provide suppressing fire. Although it is usually used as a mobile support weapon, the M247 GPMG is often permanently turret-mounted and bolted to the ground, with a large slab of armor protecting the operator. In this configuration, the weapon is fed by a drum magazine, which is considerably larger than the standard box magazine. The M247 GPMG is also commonly mounted in the troop bays of D77-TC Pelicans, which allows the dropship's crew chief to provide suppressing fire for embarking and disembarking troops; many Pelican-mounted M247s are equipped with an underslung drum magazine to complement the belt feed. M247 General Purpose Machine Gun Turret Autocannon: This variant is an autocannon that can be placed on the M312 Elephant. M247H Heavy Machine Gun: This variant is the most widely used turreted machine gun in service. M247T Medium Machine Gun: This variant is outfitted mostly on the M808 Scorpion and M850 Grizzly main battle tanks as an onboard anti-infantry weapon. This weapon shares a very similar name to the real-world FN Herstal M249E4 PIP and M240E6LW machine guns, as well as sharing a similar design and combat role. In the Halo 3 Multiplayer Beta, the packaging of the M247 can be found in the map High Ground, though the weapon does not appear in the game. The M247 GPMG in Halo 2. Forward and rear views of a portable M247 GPMG in Halo 2. Views of a turret-mounted M247 GPMG. A Marine using the portable version of the M247 GPMG. A Marine carrying a portable M247 GPMG. A Marine door gunner operating an M247 GMPG mounted on the rear hatch of a Pelican. A Spartan using an M247 GPMG on the multiplayer map Waterworks. Concept art of the base for Halo 2: Anniversary. Concept art of the weapon's Pelican mount for Halo 2: Anniversary. Sergeant Johnson arms an M247 mounted into the bay of a Pelican. A Marine mans an M247 against the Covenant aboard Cairo Station. HUD of the M247 in Halo 2: Anniversary campaign. A marine carrying the M247. An M247 with an M247H. HUD of the M247 in Halo 2: Anniversary multiplayer. A Sangheili firing an M247 on Skyward. A shield version of the M247.